I wrote a while ago about Ploy and others resistance to some money making (for them) venture from our local village head. Well one of those disadvantageously affected by the successful objection to this plan got her own back on Ploy, or at least is trying to. Ploy is selling costume jewelry at a market two to three times a week. She sold some to this local woman, in total worth about 6000 baht. She has sold to many other local people too. However after this local embezzlement scheme fell through this woman, whose husband was to get the job of the security manager for our estate, (although his present occupation is womaniser and bum), Ploy got a visit from the police to say that this woman is accusing her of selling her real gold at the value of 60,000 baht; defrauding her in effect. Now even Pinky can tell this is not real gold and you would think it would all quickly fall through. But not here where this thing is taken seriously. So Ploy has been arrested in effect, has had to appoint a lawyer to defend herself, and is now waiting for the court appearance after having made two brief appearances to make her plea. She has also had to post 200,000 baht bail to avoid waiting in prison for the case to be heard. This whilst this woman crows around the estate as to how she has 'got one over' on Ploy, (although she is not calling Ploy by her real name but by the name of female dog). There have been times in this topsy turvy year when that money would had been hard to find, but luckily this was not one of them. But there is the stress of course. Ploy is currently ill with a bad cold and it is probably related to all this. Ploy should win. 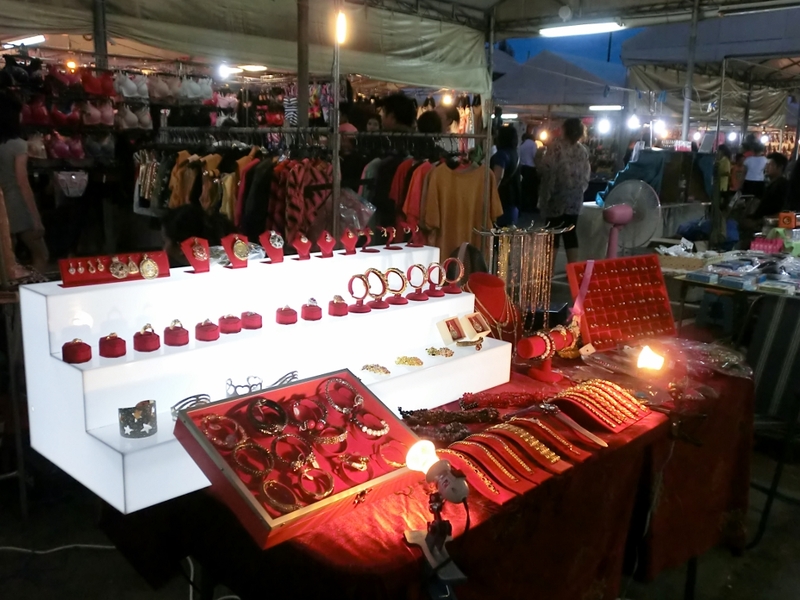 She has friends who will vouch for what she sells, photos of her stall, other customers vouching for her; she has a good lawyer - also a friend - who has government contacts which is something well worth having here. But until that day you can count on nothing here. And after that day we can counter-sue for all the stress and hassle this woman has caused. And we will. A few weeks ago we paid 13,000 baht for a vet to operate on a soi (street) dog. 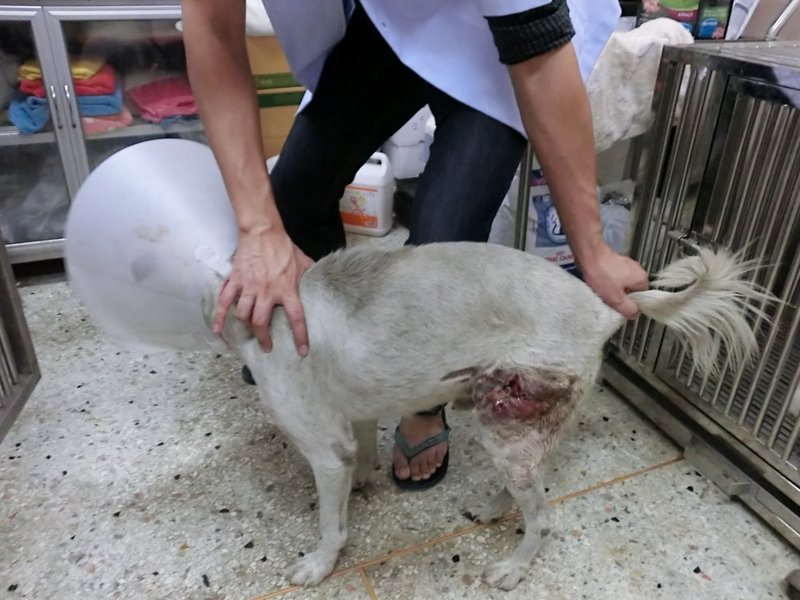 The dog, a friendly thing who always comes to see us whenever we are near, usually at a restaurant there, had an open wound on its leg that was showing bone. It was almost certainly done by someone. We also paid to have his skin sorted out, and two other cysts removed and to have him spayed. He spent almost a month at the vets, but never once did he try and bite me or even growl at me. 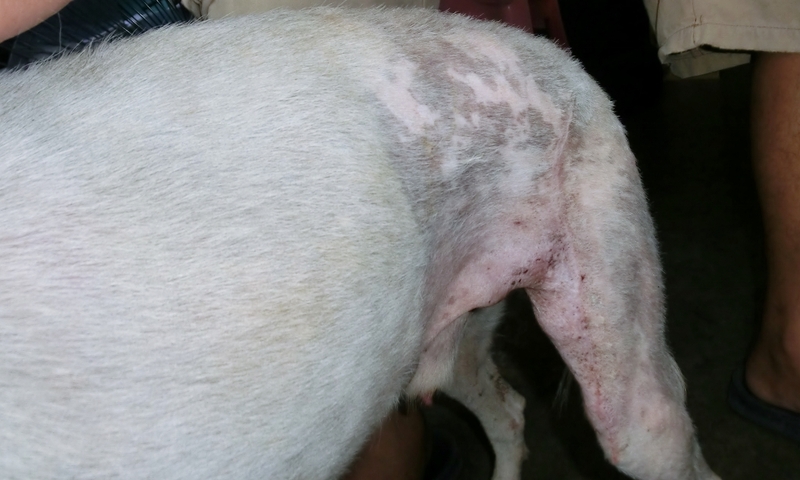 He is back on the streets now, (we cannot adopt him as Pinky doesn't like other dogs), but we make efforts to go and see him and feed him; (as do others as he has become quite a celebrity - the most expensive soi dog in Thailand!). He bounds towards us now, tail wagging so hard he almost takes off, and he is back to his favourite occupation, chasing the motorcycles as they pass by. We have had problems before with a 'partner' in Hong Kong. It came to head recently when he brazenly suggested he should help sell one of our products for us as he could do a better job. Since we have known him we have not seen a cent of any sales he has made to his customers; just the non-recurring engineering charge we nominally charged because of the expectation of future money from his products. We are now in an unofficial partnership with a US company with strong roots in Asia who we have already visited ten or more companies in Taiwan and Korea with and I will shortly visit many more with. They ask nothing of us. It is a mutually beneficial relationship. But my 'partner' thinks he can do better. Or what he truly means is he sees an opportunity to make money out of us. Out of our idea that he has contributed nothing to and can offer nothing advantageous for. We told him to bugger off. But this comes on the back of that offer we had to buy the same idea from another US company. It is quite clear now what their strategy was. This is a new market for us and we didn't know the potential. We do now. And the value they put on the product was derisory. Now you might say that is just business and unfortunately it is right. They made a judgment. A tinpot company hiding in a third world country, easy to screw over. But luckily, with the support of a friend in Singapore, we went by our gut feeling - which was Ploy and I didn't like them, one bit - and we said NO. But they kept coming back, not with improved offers, but with snide comments that we wouldn't be able to make a success of it by ourselves. That they had better engineers more able to complete it, (yet not come up with the idea in the first place, obviously). I wish we had gone with our gut feeling two years ago with out Hong Kong 'partner' but now we finally have. Today I gave 9000 baht to sponsor a dog at the Soi Dog Foundation in Phuket. I chose one of the older dogs that will see out its days at the centre. His name is Silley. I may never meet him But hopefully he will have a happy few years before he dies. He will never ask anything of me, try to cheat me or belittle me or take me to court on some trumped up charges or in any way make my life worse.